Start off your visit on the 21st (Wed): experience rural life at Mercier Orchards. For photos, where to stay, reviews, and other tourist information, refer to the Blue Ridge vacation planner . Durham to Blue Ridge is an approximately 7-hour car ride. You can also do a combination of train and car; or do a combination of bus, train, and car. Expect a daytime high around 63°F in November, and nighttime lows around 44°F. On the 22nd (Thu), wrap the sightseeing up by early afternoon so you can drive to Asheville. 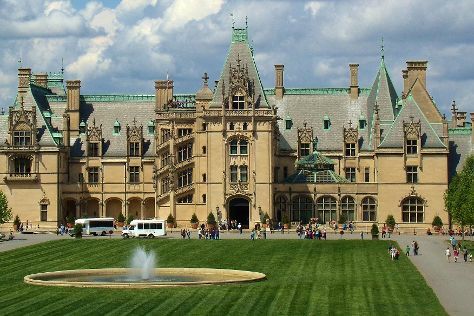 On the 23rd (Fri), indulge your taste buds at Food & Drink and then indulge your taste buds at Biltmore Estate. To find photos, more things to do, ratings, and more tourist information, you can read our Asheville planner . Traveling by car from Blue Ridge to Asheville takes 3 hours. Alternatively, you can do a combination of car and bus. Traveling from Blue Ridge in November, you can expect nighttime temperatures to be a bit cooler in Asheville, with lows of 36°F. Cap off your sightseeing on the 23rd (Fri) early enough to go by car to Chimney Rock. Chimney Rock is a village in Rutherford County, North Carolina, United States. On the 24th (Sat), learn about winemaking at Saint Paul Mountain Vineyards and then enjoy breathtaking views from Chimney Rock State Park. To see reviews, more things to do, and tourist information, refer to the Chimney Rock journey builder . You can drive from Asheville to Chimney Rock in an hour. Another option is to do a combination of bus and taxi. In November in Chimney Rock, expect temperatures between 59°F during the day and 36°F at night. Finish your sightseeing early on the 24th (Sat) to allow enough time to travel to Linville Falls. Linville Falls is an unincorporated community at the junction of Avery, Burke, and McDowell counties in the U.S. To see reviews, photos, maps, and other tourist information, you can read our Linville Falls trip planner . You can drive from Chimney Rock to Linville Falls in 1.5 hours. Expect a daytime high around 60°F in November, and nighttime lows around 34°F. On the 24th (Sat), you're off tohome.